Brussels, Belgium: Today the EU Commission published its long-awaited Communication on the Circular Economy, a package of actions that is supposed to transform Europe into a more competitive resource–efficient economy. WWF expresses its disappointment towards a plan that does not look at the whole product’s lifecycle - from sourcing to waste - and that will not reduce Europe’s enormous and unsustainable overconsumption. The Communication, initially planned for publication in 2014 was postponed by Vice-President Timmermans with the promise to make it more ambitious and comprehensive. In June this year, declarations were made that the EU will “come up with a plan that bites, that has concrete measures, that really looks at the full circle of the circular economy”. WWF believes that the current Communications fails on all of these aspects. 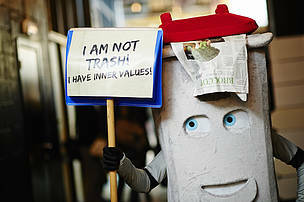 WWF believes that better reparability, durability, and recyclability of products are important elements but they will need to be complemented by concrete political action to secure sustainable supplies of raw materials and to achieve the much-needed absolute decoupling of resource use from economic growth. The industry in the EU as well as investors will need clearer signals if the circular economy is to become reality. Analysis by McKinsey estimates shifting towards circularity could add $1 trillion to the global economy by 2025 and create 100,000 new jobs within the next five years. Under the Waste & Resources Action Programme's Circular Economy 2020 Vision, the European Union (EU) could benefit from an improved trade balance of £90 billion and the creation of 160,000 jobs. Manufacturers are most likely to reap the benefits quickest given their reliance on raw materials – McKinsey argues that a subset of the EU manufacturing sector could realise net materials cost savings worth up to $630 billion per annum by 2025. The European Commission's new Circular Economy Package will create 110,000 fewer jobs in the United Kingdom, Germany, Poland and Italy than the axed bill it has replaced, according to research obtained by EurActiv. Source of the article EU circular economy package: a failed promise Today the EU Commission published its long-awaited Communication on the Circular Economy, a package of actions that is supposed to transform Europe in a more competitive resource–efficient economy.